I’m so excited to introduce today’s recipe to you! It’s gonggal-ppang, a cookie-like bread that’s puffed up like a crunchy, crusty, hollow balloon, with a coating of melted sweet syrup inside. This balloon bread was created by Chinese immigrants in Korea. I was told that the bread was originally called “air-bread” among Chinese but when it came to Korea, it was named as gonggal-ppang. Gong-gal (pronounced gong-gahl) means “fake” or “lie” in Korean. 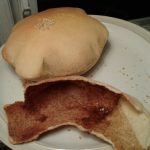 So whoever named the bread must have been a little frustrated to find out this big piece of bread was actually hollow inside! Or maybe he or she was just giving it a funny name. When I was young, I would always see gonggal-ppang displayed in the windows of Chinese Korean restaurants. It’s big and eye catching, so it was used by many restaurant owners to attract customers to come in. I tasted it only a few times, but the puffy, crunchy cookie with melted sugar syrup inside made a strong impression on me and I’ve been dreaming of it for years. 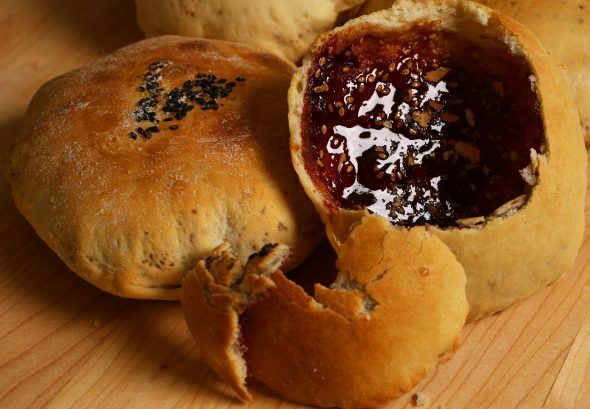 Gonggal-ppang made in Chinese bakeries are wood-fired in a circular oven, where the bread sticks to the walls of the oven. It kind of looks like how Indian naan bread is made. 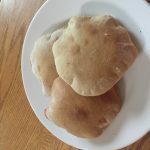 Since I started writing and filming Korean recipes, I’ve wanted to show how to make gonggal-ppang, but it took a few years off and on of trial and error to come up with this recipe that can be made in a conventional home oven. 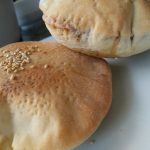 It took many tries for me to develop a technique where the filling stays in the middle of the bread, and the bread stays evenly flat before baking. I tried making the bread in my hands, but I could never get it big or even enough, and it always ended up with the sugar filling off-center. When I baked them, they never expanded enough. I ate a lot of failed gonggal-ppang over the years! Then I figured out this simple method of doing everything on my cutting board with a rolling pin. It’s been the best way to get the bread evenly thin and flat without breaking a hole in it. By the way, my most recent failure was that I forgot to switch the oven from broil to bake! : ) I was supposed to bake for 15 minutes but the bread was totally burnt in 5! All you have to do is follow my directions closely and I’m sure some of you will be able to make better gonggal-ppang than me! 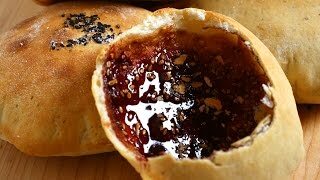 Make the filling by mixing the sugar, sesame seeds, and cinnamon powder in a bowl. Set aside. Start the dough by combining water, sugar, dry yeast, salt, and vegetable oil in a bowl. Mix well with a wooden spoon. Add the flour and mix it well with the wooden spoon. Knead the dough by hand for about 2 minutes, until it’s smooth. Let it sit for an hour, covered. Uncover the dough and knead it another minute until it’s very smooth and soft. Divide the dough into 4 equal size balls. Roll each into a nice smooth ball on the cutting board. Cover the 4 balls with plastic wrap to prevent them from getting dried out while you work. Put a non-stick baking pan into the oven and preheat the broiler. Sprinkle some flour on the cutting board. Take one ball and roll it out with a rolling pin into a 4 inch disk. Add ¼ of the filling in the center. Lift up the right and left edges of the disc, bring them together, and pinch and seal them together. Then bring the top and bottom edges together too, to make a kind of dumpling. Gently flatten and roll the disc out with your rolling pin, little by little, so as not to break it. Sprinkle some flour as needed so the dough, cutting board, and rolling pin don’t stick together. Turn it over and roll it out carefully into a 5½ to 6 inch disk. Repeat with the rest of the dough balls. Your oven and the pan inside will be very hot. Change the oven setting from broil to bake. Put each bread disk on the heated pan in the oven. Set the oven temperature to 350° F and bake it for 15 minutes. Check out the color and crunchiness of the bread. If you want it darker and crispier, broil them for 1 minute more. Let them cool down a bit and serve and eat. You can also freeze them up to 1 month. Posted on Monday, December 5th, 2016 at 9:15 pm. Posted August 25th, 2018 at 1:02 am | Log in to reply. 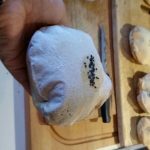 My balloon breads look great from the outside, but inside, they are very dry. Unlike syrupy sugar melt like Maangchi’s, my sugar turned powdery.. and all I taste is dry cinnamon powder..
Posted August 28th, 2018 at 9:00 am | Log in to reply. It looks well-expanded and good looking! Add more sugar to make it more syrupy inside. Posted August 15th, 2018 at 8:37 pm | Log in to reply. Do u have any receipes of steamed buns with fillings inside? Posted November 14th, 2017 at 6:07 am | Log in to reply. Posted October 26th, 2017 at 7:30 am | Log in to reply. Posted October 26th, 2017 at 7:34 am | Log in to reply. Posted November 2nd, 2017 at 8:30 am | Log in to reply. It looks amazing, your skill might be better than mine! They all look like balloons. I’m happy to hear that your family like your gonggal-ppang! Posted July 28th, 2017 at 2:36 pm | Log in to reply. Loved this recipie so much. I made it for my two year old son and he really enjoyed it. Posted June 29th, 2017 at 12:57 am | Log in to reply. I made it with filling that you gave n with chocolate filling, delicious. Thank you so much, warm regard from Indonesia for you. I learned Korean cuisine from you, love it. Posted July 1st, 2017 at 11:15 am | Log in to reply. Posted July 2nd, 2017 at 9:04 am | Log in to reply. Posted June 19th, 2017 at 2:23 pm | Log in to reply. I’ve made a few of your recipes. These turned out better than I could have hoped! My family requested that I make them again. Posted May 15th, 2017 at 1:50 pm | Log in to reply. Today I tried your gonggal ppang – I was very excited about it. But also I followed your ratio, my dough was very sticky and didn’t rise very well. They turned out quite small, too. I think, maybe there was a problem with my yeast? I didn’t use dry yeast, but fresh yeast. Have you ever tried this with fresh yeast? Posted May 16th, 2017 at 12:52 pm | Log in to reply. 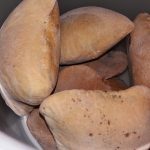 Check out if your yeast works well or not. Fresh yeast should work well, too. Posted April 16th, 2017 at 5:57 pm | Log in to reply. Posted April 24th, 2017 at 8:59 am | Log in to reply. Posted April 3rd, 2017 at 5:31 am | Log in to reply. Hi Maangchi, I attempted to make these, but something went wrong. They started to inflate, but then collapsed after maybe ten minutes, and I ended up with a more or less flat bread. I can see at least part of the problem was my tray was not hot enough, but why would they collapse like that? It happened to all of them. I was thinking maybe I rolled them too thin (they were really very thin), but I’m not sure. Posted April 2nd, 2017 at 2:29 pm | Log in to reply. Thank you so much Maangchi! What do you think of my crunchy balloons ? Posted March 30th, 2017 at 8:58 am | Log in to reply. hi maangchi..i tried this and it turned out perfect. crispy and quick recipe thanks a lot…!! Posted March 22nd, 2017 at 8:27 pm | Log in to reply. Posted March 23rd, 2017 at 5:00 pm | Log in to reply. They look like balloons inside full of air! I’m sure the other leaking 2 are also delicious. 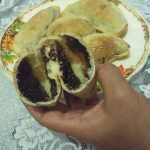 This recipe was originally posted on December 5, 2016 at 9:15 pm by Maangchi. The video was watched 862,248 times on YouTube & has 21,606 likes!